We use 5 lanes of our 6-lane pool during practice. 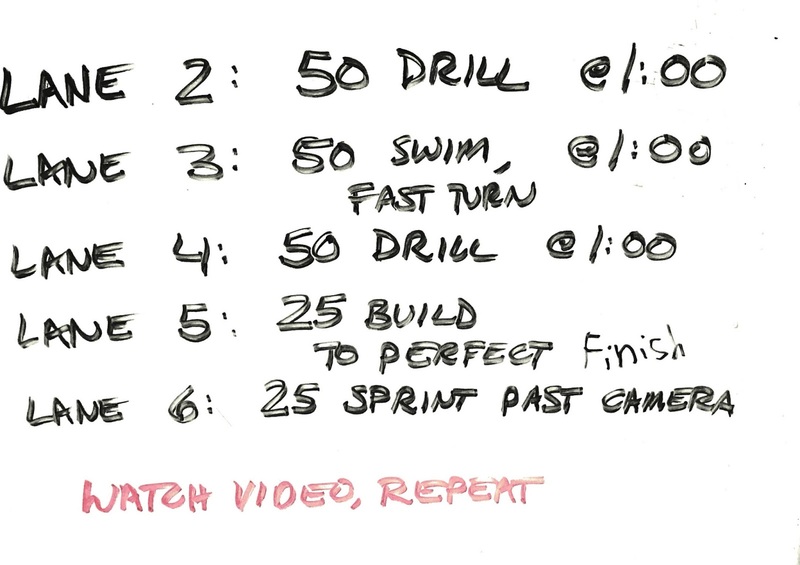 We did the following circuit that used an underwater camera hooked up to a time-delayed DVR and TV. The camera was positioned to gets “head-on” look at the swimmer coming down the lane. 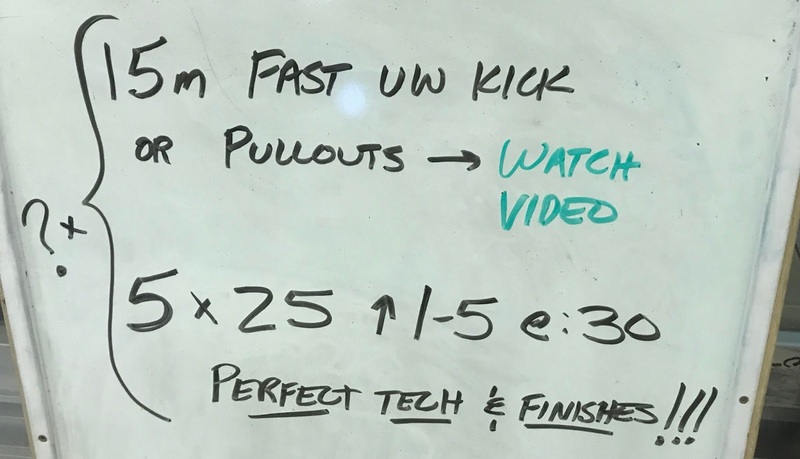 We looked at the video immediately after each swimmer finished the 25 in lane 6. This allowed us to make some technical adjustments while still performing a challenging set. Swimmers left the wall :15 apart so that the camera could adequately film each one. For this set, we set up our underwater video camera in the end lane. Swimmers performed the 15m fast underwater kick in that lane. They watched their video on a time delay on our flat-screen TV and then did the 5 x 25, one in each of our 5 remaining lanes. We repeated this circuit for 30 minutes. This could obviously be easily modified to look at any stroke or any technical aspect in that first 15m. The challenge: How to make the best use of 30 minutes of pool time with 50 teenage swimmers in 5 SCM lanes. Here is what we did. Each swimmer performed a 50 drill in lane 2, then moved into lane 3 and did a 50 swim with a fast turn, and so on. We have an underwater camera hooked to a TiVo in Lane 6, so after the swimmer sprinted past the camera, he climbed out and watched his technique with a coach. Get back in lane 2 and repeat. This one was a hit with swimmers and coaches alike. 5 lanes. 1 hour. We split up into groups and did 3 stations: 1. Video review 2. Sprint 3. Aerobic. Good workout. Here is one of our favorite core exercises. We call it 30-60-90 for each of the body angles where we pause. Have the swimmer be seated on a physio ball and have a teammate stand on his feet. The swimmer should then streamline and hold a straight line from wrists to shoulders to hips as he moves through the different angles. We like to go for 1:00 straight shifting positions about every 3 seconds and finishing with 10 seconds holding the 30 degree position. The finish is among the least frequently practiced skills in our sport, in my observation. This drill serves as a mini-progression to help swimmers adjust to the presence of the wall appropriately during a finish, thus practicing for that gold medal moment. We did this as a set of 16 x 50, 6 done like phase 1, 6 in phase 2, and the final 4 in phase 3. Here’s the progression. At the conclusion of the 50, the swimmer takes his last stroke at the backstroke flags and then positions his body for the finish, kicking strong all the way to an extended touch. Same idea as the first phase, just move everything closer to the wall. Take the last stroke halfway between the flags and the wall. Make sure the swimmer is paying close attention to the spacing with the wall. Now do an all-out finish, touching with the body at maximum length. The swimmer should touch with the fingertips. With the wall-judging ability honed in phases 1 and 2, the swimmer should be able to time his finish very precisely. Try this progression for any stroke. You never know when your finish will make the difference between gold and silver! Thank you to Heath Hudgins (the swimmer in the videos) for being a willing example. How many of your swimmers can do this? “The best oblique ab workout I’ve ever had,” said one of our swimmers after trying this exercise for 20 seconds. The Swimming Workout Wizard is on vacation this week. Enjoy some more videos from around the web. Teamwork and strength, all in one exercise! This could be awesome for chest and shoulder strength. Check out the single-leg burpees with a push-up and jump. Interesting series of exercises here. This an interesting series of exercises. Be careful with the first movement that he performs, as I think it might be a little risky for swimmers with loose shoulder joints. Over the next week or two, we’ll be highlighting a few videos of some terrific dryland exercises we found on the web. Here’s the first in the series. Here’s another abdominal exercise that we do, often for 2 sets of :30 each. Keep the ball on your lower shins, and control it using the tops of your feet. Kick from the hip with the knees straight and the hips slightly elevated for best results. Here’s an example of a terrific core exercise we do. The swimmer in the foreground is demonstrating the best technique. We typically do a set of 10 of these, rolling the swimmer on the physio ball from the chin to the knees and back each time. Inspired by the Navy SEALs Log Workout. We use these exercises to building kicking strength, teamwork, and critical thinking skills. Plus, they are a bunch of fun! We use regular 4″ x 4″ x 8′ pieces of lumber that you can pick up at your local hardware store (be sure to measure the width of your lanes to know how long a piece of lumber you can use) Depending upon the strength and ability of your swimmers, I recommend putting between 2 and 6 swimmers on an 8′ log.